Tucker Hibbert will be featured on NBC’s TODAY Show Tuesday, March 5. 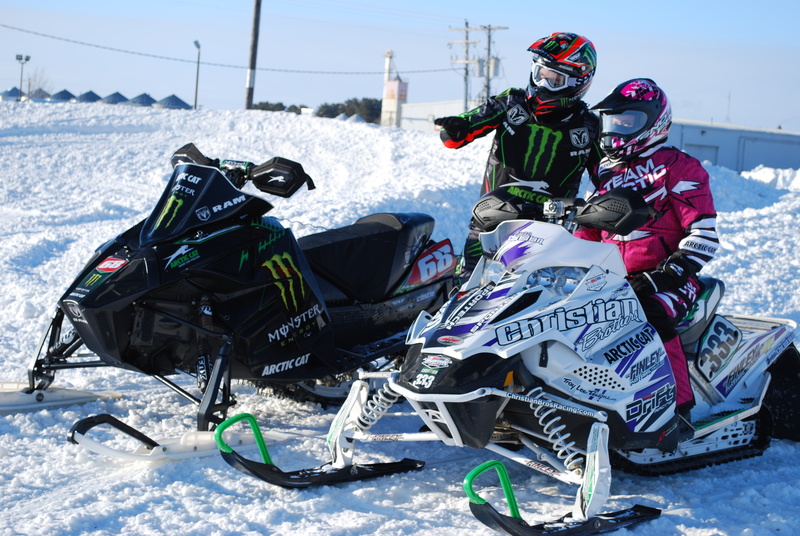 Recently, co-host Sara Haines took her “Sara in the City” segment on the road to Minnesota to build an Arctic Cat snowmobile at the factory in Thief River Falls and learn how to ride with Tucker. The three-minute feature will air during the fourth hour of TODAY with Kathie Lee and Hoda. Check your local listings for the exact air date in your area. Winner Announced in Everyone Wants a Piece of Tucker Contest! In what has turned out to be a record setting event tied to Tucker Hibbert’s name, the Everyone Wants a Piece of Tucker Contest concluded this past January with over 26,000 ballot entries. The exclusive contest provided the opportunity for one individual to win serial #0002 of Tucker’s 2013-limited build Arctic Cat F 800 Procross Race Replica sled. The lucky individual whose name was selected in the final drawing was Doug Bay of Mt. Jewett, Penn. As if winning Tucker’s race replica F 800 isn’t enough, Doug will also receive an all expense paid trip, this week, to the home of Arctic Cat in Thief River Falls, Minn. for the unveiling of the snowmobile and to spend the day riding alongside ace snocross phenom and first ever six-time Winter X Games gold medalist Tucker Hibbert. Joining Doug and Tucker will be SnowTrax Television’s Luke Lester who will host the ride and cover the fulfillment for an upcoming special story segment scheduled to air the week of March 18th on SnowTrax Television’s national broadcast network. Join Team 68 and help Tucker Hibbert celebrate his record-breaking X Games Aspen 2013 performance with his Limited Edition Gold Medal 6-Peat T-Shirt. Only 168 shirts will be produced and each will be numbered and autographed by Tucker himself. The shirt features his signature 68 printed in gold foil on the front with bright green and gold foil graphics on the back. Pre-orders for the 6-Peat shirt begin today and will close at 12 pm CT Sunday, Feb. 17 or when the shirt sells out. Orders will only be accepted online through Tucker’s Official Merchandise Online Store and available to ship to customers in the United States, Canada, Denmark, Finland, Iceland, Norway, Sweden and the United Kingdom.